When it comes to home security, any local locksmith will tell you that there is nothing quite as classic as the deadbolt, and that’s for good reason. 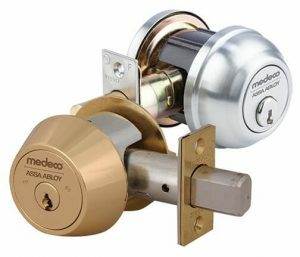 Deadbolt locks differ from traditional spring locks as the cylinder inside the lock can only be moved when the key is in the lock or the twist knob is turned. In layman’s terms, that means you can’t simply use a credit card to get a deadbolt open! And lucky for you, thanks to our superior lock services in Waco TX, you can count on expert deadbolt lock assistance 24-hours a day. There are many different styles of deadbolts to choose from but there are two major types of deadbolt locks: single cylinder and double cylinder. The only difference between the two is that single cylinders have a twist knob on the interior and a keyhole on the exterior, whereas double cylinders feature keyholes on both sides. Double cylinders, while providing extra security, have the drawback of being a potential fire hazard due to the requirement of an interior key, which could be misplaced in the event of a fire and result in the building’s inhabitants getting trapped inside. One easy way to prevent this is to keep a spare key near to the door at all times. Here at Waco Locksmith Pros, we have extensive experience when it comes to installing deadbolt locks. Our team of seasoned professionals will install every deadbolt in your home or business quickly, efficiently, and at an affordable rate. Using precise measurements and a strong eye for detail, we’ll make sure your deadbolts are right where they need to be in order to get you in and out of your property with no hassle while simultaneously providing you with the security your property needs. In addition to deadbolt installation, we also specialize in deadbolt repair. No matter what happens, whether a would-be intruder scratches the finish on the outside or you accidentally damage the twist knob inside, we’ll be there 24/7 to get everything back to working order. Lose Your Key? No Worries! We are a local emergency locksmith providing 24-hour locksmith services. No matter what time of day or night, we’re available to help get you inside or simply provide you with a spare key. Thanks to our extensive knowledge of all types of locks, we can assist with any other lock troubles that you may have on your property. Our staff is friendly and professional, and we won’t leave you waiting no matter how hot the afternoon or how busy the night is! We provide all types of locksmith services in Waco Texas; everything from installation and maintenance to security audits. We are an automotive, residential, and commercial locksmith company and all of our technicians have a minimum of five years experience. As a mobile locksmith, we come to you no matter the time of day and we bring all of our state of the art tools with us. No job is too big or too small for us, and we look forward to being technician you can trust with the most important thing of all – your security. We also guarantee fair and upfront pricing for all of our services and we will arrive at your location in half an hour or less from the time your request our locksmith services. We are fully licensed, bonded, and insured for your added protection and you can always count our friendly technicians to provide you with quality service and honest, dependable security advice no matter what. And we can work with all of the top name brand locks such as ASSA ABLOY and more! So, don’t let a lockout or lost key ruin your day. Simply get in touch with us and enjoy hassle free locksmith solutions for your deadbolt locks, biometric locks and a whole lot more. Deadbolt Locks https://locksmithwacotexas.com/lock-services/deadbolt/ 3.9/5 based upon 19 reviews.